Swanky Studio Salon and Spa @Urban Loft was established in 2013 and since then we have been blessed to watch our team/family grow. With some of the most amazing and educated Hairstylists, Nail Technicians, An Esthetician and Massage Therapist, we offer services ranging from Hair and nails, to skin care, tanning, and a range of Massages suited just for our clients needs. Our stylist are some of the most knowledgeable in the industry and they are ready to give their clients the perfect Color, Highlight, perm or style they are looking for, and our Nail Technicians are highly trained in Spa Manicures and Spa pedicures, Acrylic nails and Specialize in Nail Art. Our clients happiness is our #1 goal! 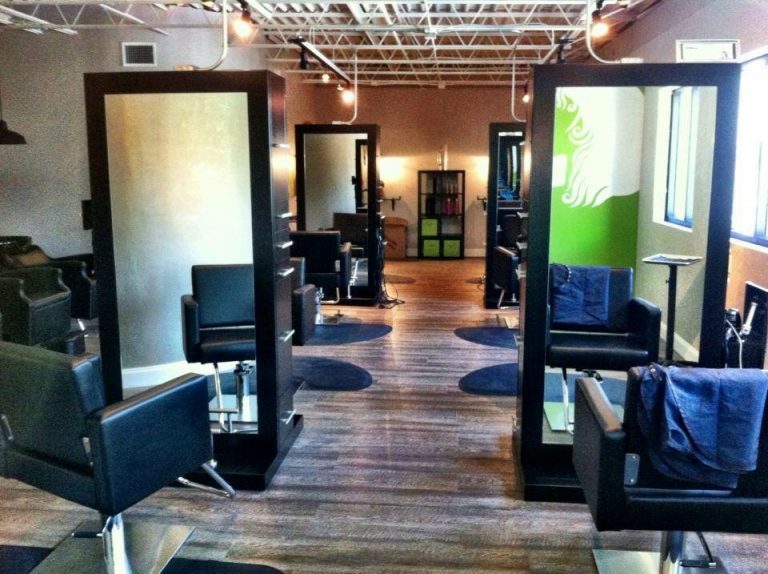 We have experienced and friendly stylists that can treat and care for all hair types. Whatever your needs may be we have the stylist, manicurist or specialist for you! Give us a call today for your next appointment! We have exceptional stylists, all specializing in Color, Perms, Ethnic Hair, the latest in cuts for everyone in your family, Hair Extensions, and Waxing. Our nail services include Acrylic Nails, Spa Manicures (paraffin wax included in every one of our manicures), and pedicures in which we use a variety of sugar scrubs guaranteed to revive the most tired of Tootsies! Most people have unwanted hair and our technicians will happily remove any unwanted hair by gently using warmed wax. See our services below. Get that gorgeous summer sun kissed glow all year long! Tanning services offered by Audrey, Kaley, Chelsea or Cassie. If you would like to speak to one of our Hair Stylists, Nail Technician or Waxing Specialists simply stop by our salon and we will help you choose a service that is custom tailored to your needs. I am first and foremost a woman of Faith, a wife to Chad and a mother to a beautiful son I adore. I have been in the industry for 20+ years, graduating from Cindy Lee's Nail Institute in 1995. I own all Swanky locations and love what I do everyday and the Swanky Family and clients that I get to spend my days with. I specialize in Acrylic Nails, Gel manicures, therapeutic pedicures and nail art. Our clients are our family and we like to make sure every one of them are home when they are with us! Hope is the lead stylist with Swanky Studio @Urban Loft. Hope has been a part of the Swanky family for the entirety of her career, starting as salon assistant until she graduated college. She is a master with Tigi Colour formulation. Hope dedicates herself to her clients and enjoys exploring her creativity. Being a native to the area she has built an incredible clientele that she adores. She graduated from Daytona State College and has been in the industry since 2008. Ashley has been in the industry for 10 years. She graduated from the International Academy of Hair design. She specializes in multi-dimensional color and highlights. Ashley's passion in life aside from her 10 year old little boy is to make her clients beautiful! Christie was raised in New Smyrna Beach and graduated from New Smyrna Beach High School in 1995. She is a mom and loves spending time with her kids. In her personal time and enjoys fishing, hunting and being outdoors. With a passion to make people feel good, the beauty industry called her name. She has been a stylist behind the chair for 10 years..She went to International Academy of Hair design and started her career in Spruce Creek Fly in, working there for 8 years before moving to the Urban Loft. She specializes in custom coloring, highlights, and stylized cuts to match her clients personality. You can expect a thorough consultation with a detailed advisement and hair design and coloring best suited for your needs. Kristine has been the the industry for 7 years..she graduated from Daytona State college. Kristine loves to give a thorough consultation and is patient and understanding. She loves her clients and enjoys meeting new clients as well. Kristine specializes In highlights and color as well as men's haircuts. Chelsea has been a stylist for 5 years. She graduated from International Academy in Daytona. Chelsea's clients are her extended family. Chelsea specializes in coloring and cuts. Chelsea also loves doing men's and kids cuts. She makes you feel relaxed with scalp massages and keeps your hair conditioned with doing amazing conditioning treatments. My name is Peggy Kayholm and I moved here from Michigan 2 years ago. I have been married to Rick almost 30 years. Our secret to a lasting marriage - sense of humor. I have 3 grown sons and 8 grandchildren. I love being a gramma. Those kids have gotten me to do the craziest things and I have 3 Youtube videos to prove it. I've always loved the ocean but never learned to swim. I love the sunshine. I made a shell garden with shells that we picked up on the beaches. Being a stylist is the job I was born to do. I never get bored with it. I even cut hair while in the hospital having babies. Told those nurses "find me a pair of shears". I would say "color" runs through my veins. I love clients who gush with happiness. I excel in dimensional color. I love people, talking and a good story. I never met a stranger. Can't wait to meet you! Having been a part of the cosmetology industry for eight years, I obtained my degree from Albany Technical College. Men's cuts and formal updos are my passion. I also specialize in cutting, texturizing, color and styling. Born and raised in south Georgia with manners and hospitality, have only better helped my skills to connect and understand my clients. Individualism is a unique quality that makes this business interesting and worthwhile everyday. Hair is one of the many expressions we can use to shape and mold our personalities. Offering hair healthy advice into those expressions is my favorite aspect of the industry. I'm glad to be one of the newest members of the Swanky Studios family. The beginning of my career in cosmetology began in the late 70's. Upon moving to Florida I have worked with some of new Smyrna's finest. Having 35 years in the hair industry, I continue to service my clients also venturing out into my new career of becoming a licensed massage therapist. I now offer massages with the salon, providing therapeutic as well as relaxing table and chair massages. I love what I do and do what I love! Cassandra has been a nail tech, master at nail art and in this profession for 16 years, Working under the areas best nail techs her entire career. She is a third generation nail tech and former co-owner of Studio Nail design. She strives on the quality and speed of her work. Her clients are family. She's a native of NSB and loves locals and local business'. She enjoys raising her family here with her husband and just as importantly being a part of the Swanky family! Jennifer has been a licensed Esthetician since 2003! She has worked behind the chair and on the business side of the industry and after taking a little break to raise her two boys, she is back doing what she loves! She is certified in PCA Skin products and truly wants to help treat any skin concerns you may have and pamper you while doing so. Jennifer specializes in personalized facials, chemical peels and face/body waxing. She is happy to be a part of the Swanky Family and is looking forward to helping everyone achieve their best skin possible! When she's not making you feel best, she is spending time outdoors with her family either on the water or some sort of ball field! I was born and raised in Deland Florida but decided four years ago I wanted to raise by son at the coast and relocated to New Smyrna Beach. I graduated from Daytona State 14 years ago and have loved making people feel beautiful ever since. In my free time I love spending time with my family and being on the water. Ohio born, Florida raised... Beach Bum at heart. In my off time you can find me on my kayak, at the beach, exploring Florida's natural springs or stuffing my face at locally owned restaurants with my family and friends. I love being behind the chair doing everything from men's cuts, kids cuts, woman cuts, wide variety or color and highlighting techniques, keratin treatments and facial waxing. I have 8 years of experience and keep up with the trends.